Cartoolstore are Approved Stockists of. Teng Tools 6 Drawer Top Tool Storage Box. Teng Tools Part no: TC806NF. Teng Tools 800 Series, 6 Drawer Top Box with Ball Bearing Slides. All Teng Tools boxes are made from heavy gauge, top quality steel for longer life and stability and are powder coat painted with a 5 step rust prevention and undercoat to prolong the life of the paint finish. Eva matts included for all drawers to minimise scratching. 2 stage ball bearing slide system so that the drawers open smoothly and fully. 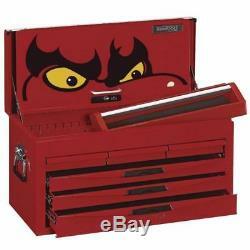 Drop front top box with the "Teng Tools Eyes Logo" to make the tool box more distinctive and eye catching. 3 full width drawers and 3 smaller draws secured by a drop front cover with a combination lock. Removable plastic tote tray with aluminium handle. Heavy duty carrying handles on each side with rubber dipped grips for added comfort. 2 Stage ball bearing drawer slides. Holds up to 12 Teng Tools TC Trays to build your own tool kit. Drawer 1 sizes; W 172 X D 270 X H 50mm. Drawer 2 sizes; W 172 X D 270 X H 50mm. Drawer 3 sizes; W 172 X D 270 X H 50mm. Drawer 4 sizes; W 572 X D 270 X H 50mm. Drawer 5 sizes; W 572 X D 270 X H 50mm. Drawer 6 sizes; W 572 X D 270 X H 75mm. Overall Dimensions: Width: 660mm x Depth: 305 x Height: 380mm. In Stock & Ready for Immediate Dispatch. All Sales Include a Vat Invoice Where Applicable. Cartoolstore Price includes VAT & FREE P&P to All The UK. Check out our Store for More Premium Quality Offers. The item "Teng Tools 6 Drawer, 8 Series Top Box with Ball Bearing Slides in Red TC806NF" is in sale since Saturday, November 25, 2017. This item is in the category "Home, Furniture & DIY\DIY Tools & Workshop Equipment\Tool Boxes & Storage\Tool Boxes". The seller is "cartoolstore" and is located in Wetherby. This item can be shipped to United Kingdom, Antigua and barbuda, Austria, Belgium, Bulgaria, Croatia, Cyprus, Czech republic, Denmark, Estonia, Finland, France, Germany, Greece, Hungary, Ireland, Italy, Latvia, Lithuania, Luxembourg, Malta, Netherlands, Poland, Portugal, Romania, Slovakia, Slovenia, Spain, Sweden, Australia, United States, Canada, Brazil, New Zealand, China, Israel, Hong Kong, Norway, Indonesia, Malaysia, Mexico, Singapore, South Korea, Switzerland, Taiwan, Thailand, Bangladesh, Belize, Bermuda, Bolivia, Barbados, Brunei darussalam, Cayman islands, Dominica, Ecuador, Egypt, Guernsey, Gibraltar, Guadeloupe, Grenada, French guiana, Iceland, Jersey, Jordan, Cambodia, Saint kitts and nevis, Saint lucia, Liechtenstein, Sri lanka, Macao, Monaco, Maldives, Montserrat, Martinique, Nicaragua, Oman, Pakistan, Peru, Paraguay, Reunion, Turks and caicos islands, Aruba, Saudi arabia, South africa, United arab emirates, Ukraine, Chile.